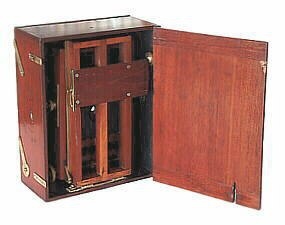 I have always been fascinated with unusual 19th century camera designs - those that departed from the conventional. The rarely seen Lucidograph by Thomas Blair represents such a departure. Designed over a two-year period, the Lucidograph was probably introduced in 1885* as an inexpensive alternative to the larger view cameras of the day. According to one catalogue, the name "Lucidograph" might be Greek for "Light-writer." Blair's concept was to build a compact, inexpensive view camera aimed at the amateur market. It had many traditional view camera features such as fine focusing and swings. While appearing in Blair catalogues throughout the 1880s, the camera was dropped before the mass amateur market appeared -- which probably accounts for its rarity. Note: The amateur market exploded in the 1890s. The most distinctive feature of the Lucidograph is the ability to fold into it's own polished mahogany wood body -- which became a protective case for the bellows and lens. Any "self-casing" style view camera is extremely rare. Unlike the immensely popular leather-bodied, self-casing cameras of the 1890s, the Lucidograph did not use a bed to support its focusing rails. A traditional self-casing camera's front panel drops 90 degrees to become a bed for the front standard. However, Blair approached the design differently and made the Lucidograph's front panel swing to the side like a door. The focusing rails would then drop 90 degrees and attach to the side-mounted door. The smallest and largest Blair Lucidograph models sold. 1/4-plate and whole plate formats are the rarest of all versions. Another noticeable design feature is the Lucidograph's small size in relation to its format, which was achieved by not using a reversible back. 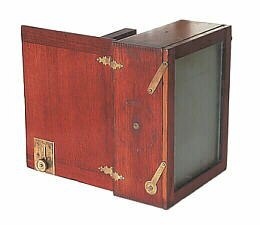 By using a simpler spring actuated ground glass assembly (patented 1884), Thomas Blair was able to construct a camera that was only 1-1/2 inches larger in height and width than the photographic plate. In spite of the self-casing design and small size, the Lucidograph retains many desirable features such as a rise/fall lensboard, fine focusing, and double swings. According to advertising, the "swing back" was not deemed desirable for the camera's intended use and a "double-swing front" was created. In essence, the front focusing rails can tilt up/down and side-to-side -- a very innovative design. 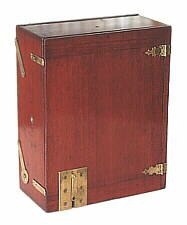 The Lucidograph body is constructed of highly polished mahogany while the interior is cherry. The bellows is made of A1 rubber, card-board and silesia (a twill-weave cotton fabric). 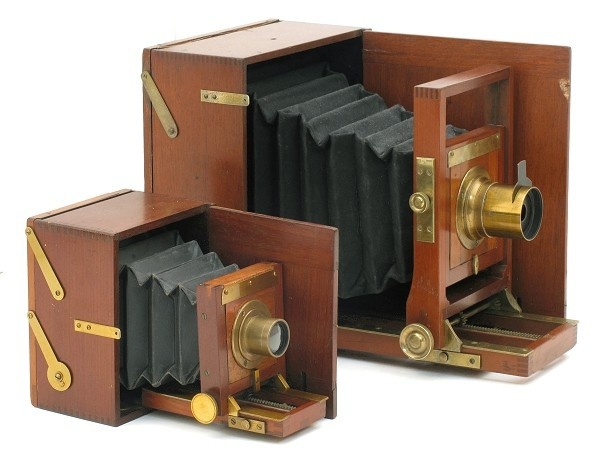 The camera was available in formats from 3-1/4 x 4-1/4 inches to 6-1/2 x 8-1/2 inches. The whole-plate model (6-1/2 x 8-1/2) was introduced sometime after 1887. As a note, the 3-1/4 x 4-1/4 inch and 6-1/2 x 8-1/2 inch formats are especially rare, with only a few examples known of each format size. Lucidograph cameras were sold as complete outfits (with a Blair landscape lens, plateholder, tripod and canvas case), or as a body for buyers to supply their own lenses and accessories. This particular example is a body-only, whole-plate model (Catalogue No.1564 E) with an owner supplied landscape lens. The body sold for $16 in 1890 ($303 in year 2000 dollars). The owner's name (E.B. Crosby, Lockport) also appears on the camera. May 2000: Newly acquired information indicates that the Lucidograph was available as early as 1884. An 1884 Blair catalogue includes an image of an unnamed camera resembling the Lucidograph. October 2010: Updated webpage to include the rare 1/4-plate version.